This year I’m trying really hard to be more intentional about my self-care routine. Carving out some time to take care of you is really important. We spend a lot of time taking care of others, and if we don’t take that time for us, pretty soon we’ll find we don’t have as much to give to those others. Over the last few months I’ve been reminded that one of the ways I used to love making time for taking care of me was through at home spa treatments, and homemade face masks top my list of at home spa essentials. In some ways I feel like I do all right in taking time for me, and in others I feel like I’m spending a lot of time doing something and don’t make time to rest and pause for a moment or two. In my quest to carve out some more ‘down’ time I’ve rediscovered that sometimes simple little things like taking the time to have Spa Night at Home can be a great lift to the spirits. Or combining a little pampering with something else I enjoy like an At Home Pedicure and a good book can force me into that rest and pause place. But nothing does this quite as well as treating yourself to a homemade face mask. One of my favourite things about homemade face masks is how quick and easy most of them are to make. Chances are you have most of the ingredients already in your fridge or pantry. Not only are they often quick to make, but you know what all the ingredients are, and you can tailor them to suit your mood. Number three is the best benefit of face masks, at least for me. I’m always busy with something, some days I don’t stop until my head hits my pillow. Doing something for myself that forces me to pause and relax and do nothing until the time goes off helps me find my center again. I come away feeling soothed, refreshed, and with less chaos in my head. Give it a try and see what I mean! One of the really nice things about face masks is they require only a few basic necessities and you’re good to go. towels – one for drying the face and I like to use one towel to protect the couch cushions or my pillow, depending on where I’m kicking back to relax. moisturizer – for after if needed. timer – so you can keep track of how long you need to leave the mask on for. ingredients for the mask – these will vary depending on what your recipe calls for, but often times these are really simple too. Gather up your supplies and put them where you will need them. Then take a few minutes to remove any make up and wash our face. Follow the instructions from your favourite homemade face mask recipe. If you don’t have a favourite recipe or you’ve never tried a homemade face mask before, or you’re in the mood to try something new, read on. I’m sharing a few links to other sites with recipes that I’ve tried and loved! The wonderful thing about homemade face masks is that they are so diverse. There are a ton of recipes out there for you to try, and they treat a wide range of skin conditions and cater to all different skin types. Below you’ll find links to some of my favourites. This post is a wonderful collection of not just masks, but body scrubs as well. My favourite is the Breakfast Mask. It leaves the skin feel soft, smooth, and refreshed. It’s a wonderful way to end the day, despite the name. 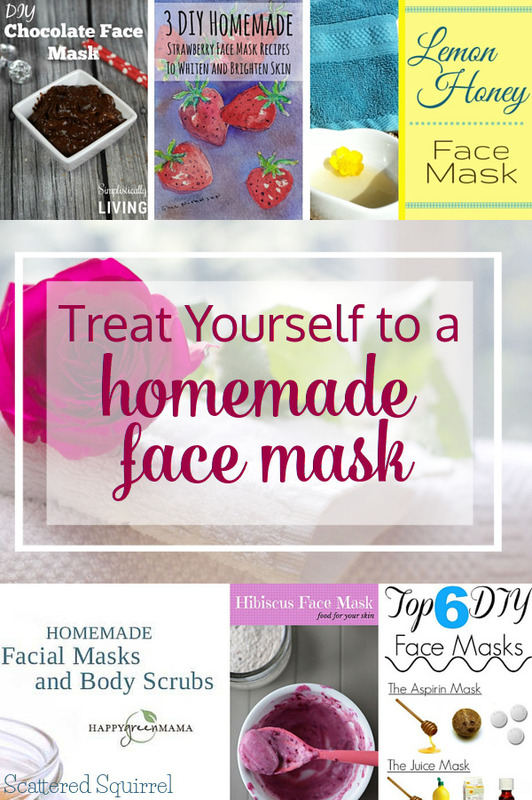 As the title says, there are 6 different homemade masks you can try in this post. My favourite by a long shot is the Milk Mask. It’s such a simple to make mask, and it leaves your skin glowing and refreshed. It’s a perfect mid-week pick-me-up mask. Does this one really need an explanation? There is no other word to describe this mask than decadent. I felt like a princess when I used this one. Again it’s easy to make and would pair really well with a nice glass of wine and some dark chocolate to nibble on. This one is one my favourites to use at the end of an especially hard week because it’s a great way to indulge and reward yourself. Strawberries are a wonderful ingredient for skin care products. In my search for homemade face mask recipes they popped up a lot, and this post not only has some great recipes but it explains why strawberries are such a powerhouse for skin care. I have not tried the last mask recipe in this post, though I love the idea of using champagne for a mask (it would be a wonderful mask to use on girls night in) but I have tried the first two and loved them both! Last year, my friend Gabi from over at Restful Living asked if I would be willing to share some of the recipes I use for at home spa nights. One of the recipes I shared is still my favourite go to for a quick homemade face mask. Not only is this face mask easy to make, if you add a little sugar to it it makes a wonderful lip scrub! If any of the the above recipes appeal to you, just click the titles to top on over and check them out. They are all absolute wonderful in my opinion. 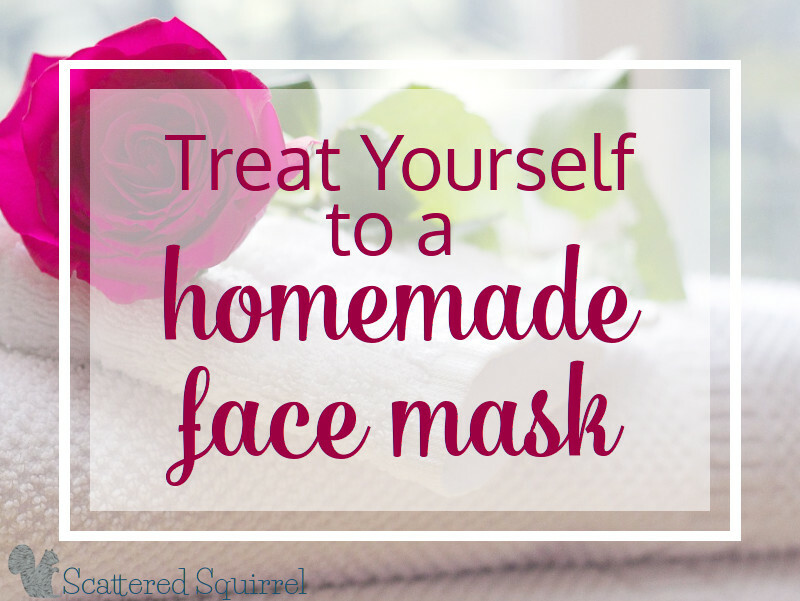 Homemade face masks are a great way to carve out some time for yourself. They don’t have to take much time to make and the benefits are amazing. Not only for your skin, but for your spirit too. So if you’re in the need of a little pick-me-up or are craving a little alone time, take the half-hour to show yourself a little love. Do you have a favourite homemade face mask? Or perhaps you have another way you like to treat yourself? I’d love to hear about it in the comments! Taking care of ourselves is so important but often neglected. Thanks for sharing these great mask ideas!! It really is so important, and yet it’s one of the easiest things to forget about isn’t it? You are really keeping self care in the minds of busy moms and I think that is a good service indeed. We don’t take care of ourselves enough. Great ideas for moms who like a spa treatment at home. Thanks Sheila, it’s tough to remember we need to take care of ourselves and it’s something I’m so bad at myself, so I’ve been looking for ideas that are quick but still have that extra bit of pampering in there.